UK Stampin' Up! 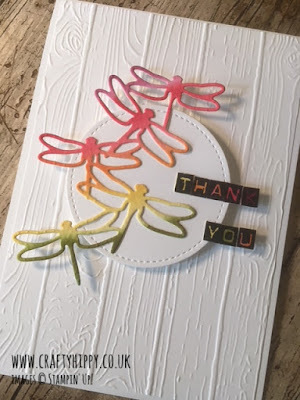 Demonstrator | make beautiful cards | Crafty Hippy: Rainbow Dragonfly Card - Create this thank you card using the Detailed Dragonfly Thinlits Dies by Stampin' Up! 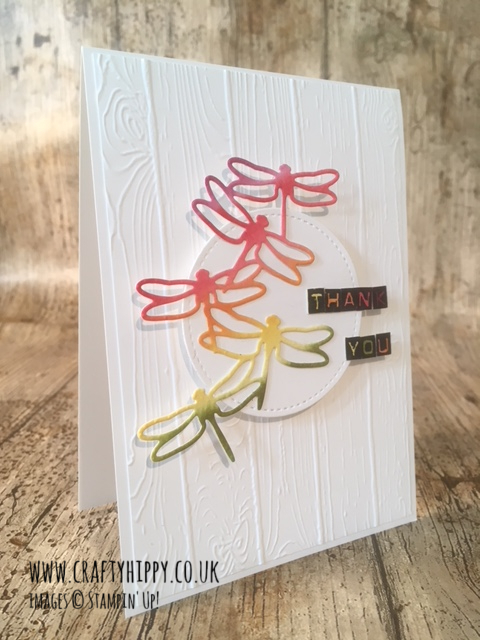 Rainbow Dragonfly Card - Create this thank you card using the Detailed Dragonfly Thinlits Dies by Stampin' Up! I do! 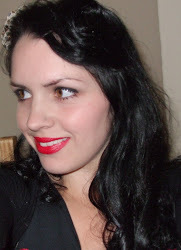 I can't resist them. There is something about a spectrum of colour that is very pleasing to the eye. I also love butterflies and dragonflies, which are very popular in cardmaking. As a result I can't resist the Detailed Dragonfly Thinlits Dies which I used to make this card. As I mentioned earlier in the week I keep a stash of Watercolour Paper that has been water-coloured in a variety of colour combinations (but mainly rainbows!) so that I can cut it for use whenever I fancy using some. Isn't it gorgeous? 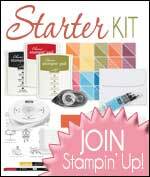 You can swap the embossing folder or change the colour of the inks used for a completely different look.